„Erfrischend ist die Virtuosität, die Lust am Zusammenspiel der Musiker und die Energie geladene Atmosphäre des Albums. Trotz der scheinbar chaotischen Grundstimmung wirkt sich das Gitarrenspiel Siedhoffs wie eine Verbindung zwischen den einzelnen Stücken aus. Ein Versuch, die unterschiedlichsten Kulturen dieser Welt mittels musikalischer Kompositionen zu verbinden. Unsymmetrisch, exotisch, groovig- ein kleines instrumentales Meisterwerk. "Sin Distancia" is not only the name of the musician trio to Manuel Delgado, Ernesto Martinez and Ralf Siedhoff. The name is also synonymous with the "Bilderhaus Gschwend". Artists and audiences come there especially close, even "without distance". Just connect the trio rhythmic dances and the sounds of Latin music together. Here, too, determines the acoustic perception programmatic area. Guitarist Ralf Siedhoff and Manuel Delgado on the flamenco guitar mediated images in house by carefree game of Mediterranean flair with touches of jazz and flamenco. Whose emotional passion and temperament brought the percussion rhythms Ernesto Martinez powerfully expressed. The fiery rumba "Bellamar" or the sparkling pearly "Buleria del Deseo" testified of sparkling passion of continuous melodies whose accented game met an enthusiastic audience. The audience experienced again and again, as the musicians - almost in a trance - brought in economical accompaniments in the interaction to be in the next moment held by a driving percussion on topic. Most concert posts were original compositions that come from the current CD production of Sin Distancia trio "Soleado". The Indian soundscapes in "Behind the Mirror" kept the audience wonder about the origins of the Spanish gypsy music. An unusual feeling of hearing Manuel Delgado’s daughter Carmen added with her tango bandoneon-heavy game in the multi-faceted tunes consequences. With the flattering harmonies determining the rhythm percussion nearly got into the background. Ernesto Martinez brought himself with a superb solo performance on his percussion instruments at the concert audience in mind. He created the sound itself rubbing palms together to rhythmic style element, as chants of "La-La-La" or "Takataka". Without hesitation the audience followed the "exercises". Again to the quartet had grown ensemble sprayed finish with "Negrita" unleashing dynamics and adopted almost dreamy with a wistful melody. The flamenco guitarist Manuel Delgado from Barcelona and the jazz guitarist Ralf Siedhoff from Weimar met first in August 1997. What started with an international meeting of musicians in Tunis and a concert in the Amphitheatre of Carthago became within one year "The Guitar Duo" whose first CD was recently completed. For one week they are now on tour in Germany and within this tour they guested in Bamberg last Thursday in the "Neuen Palais". So for the opening of the season there was a dialog in guitar-language between the north and the south of Europe. Rather in various guitar-languages because the different musical roots of the two musicians are also the main topic of their co-operation. With their own compositions they are searching for a way without musical borders. Certainly the flamenco and Iberian stylistic elements are dominating even if some African, Indian or Middle Eastern sounds smuggle into the songs now and then and Siedhoff does not deny his jazz origin. 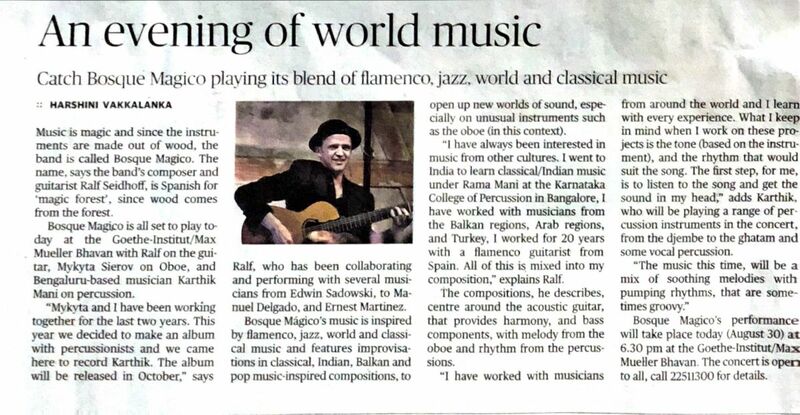 Already with his first piece "Aquellos Gitanos" Manuel Delgado swings himself up to flamenco flights to which however Siedhoff knew how to add a few jazz elements. The result therefore was very distant from every folkloric banging melodics which are sold to every holiday-maker in Andalusia in the dives of Malaga as the real flamenco. Delgado brought the warm spain with his Solo Buleria (one variante of Andalusian folk music) to the autumn Germany. With "Dorsaf", which is dedicated to a female Tunisian singer, Delgado and Siedhoff reminded of the World-Music-Festival in Tunis that brought them together and whose musical elements, which were assembled there, formed their style. The Siedhoff composition "Waiting for a friend" shows the attachment to the free-jazz as well as to the Indian Raga music. And there are far more possibilities. Siedhoff underlined this later with pieces like "Song for the Raï-House" - his musical home in Leipzig - or "Kleines Lied" where the play with jazz and folk elements was mixed with free improvisation. But the two guitarists do not play themselves or their styles in any way against each other. The harmony was perfect and if one of them performed a furious solo the other one formed the suitable background. On their trips into new sound spheres they drive each other forward. Perfectly tuned caesuras, abrupt changes in time, breathtaking fast successions of chords - the general impression of the evening was a strong dynamically push forward - a musical vortex. And with the partly maddening tempo of the pieces both of them showed commanding knowledge of guitar-playing. That also includes stroking, tapping, striking or sweeping, which allowed the two musicians to elicit additional nuances from their acoustic guitars. So there was not only technically brilliant resonance but also very intensive expression. Even though the words are borrowed from another genre of music it shall be allowed to say that the concert of the Guitar-Duo had "groove and soul".